A tri-tip cut of beef looks like a large, triangular-shaped, extra-thick steak. It is actually a roast. This is a cut of beef from the lower portion of the sirloin. Ti-tip roasts are best grilled, broiled or oven roasted. This is How to Cook a Tri-Tip Roast in the Oven. 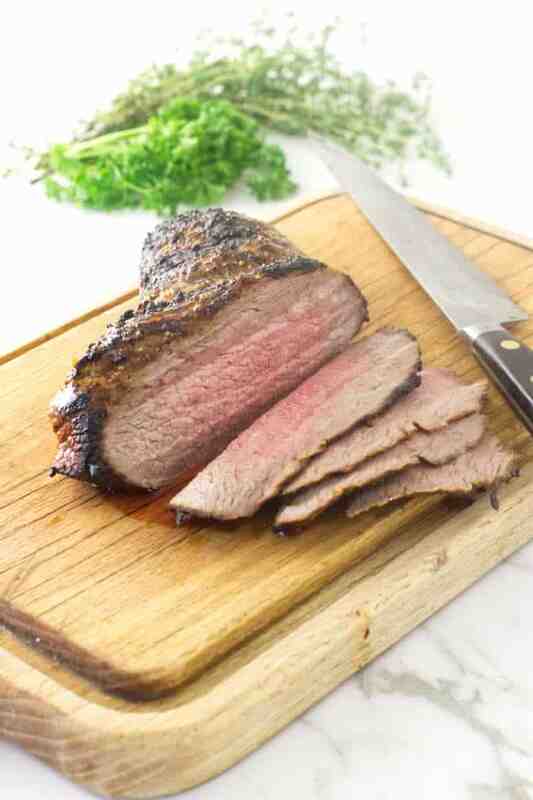 The tri-tip has a rich, flavorful beefy taste, it is budget-friendly and family size. Here is How to Cook a Tri-Tip Roast in the Oven. One thing about this inexpensive, flavor-packed cut of beef is that it has very little fat and we all know fat equals flavor. Letting the tri-tip soak in a marinade or smeared with a spicy beef rub will really enhance the flavor with this cut of beef. 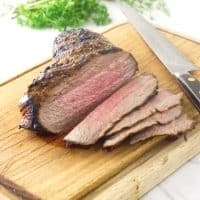 A tri-tip roast generally weighs about two pounds which makes a perfect main entrée for the average family. 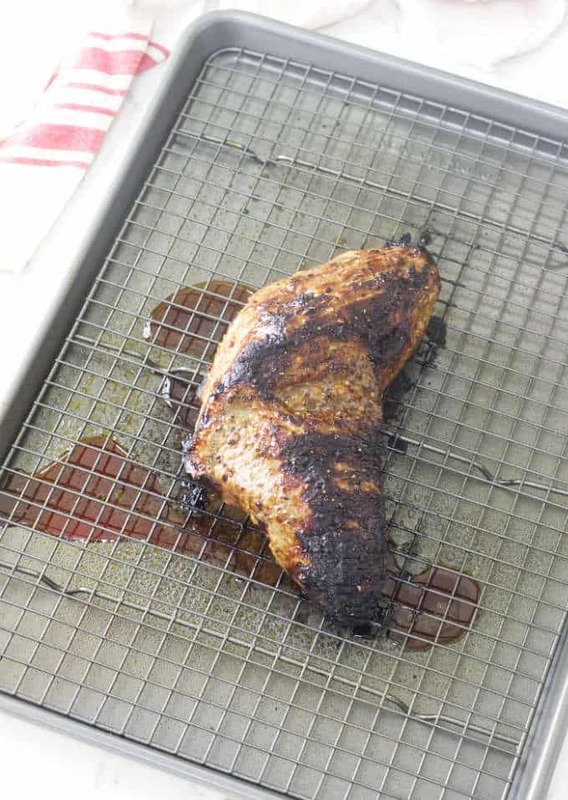 Since a tri-tip roast is so lean, it can be a tougher dryer meat unless it sits in a wet marinade or dry brine rub. Prepping the tri-tip makes all the difference in the flavor and juiciness of this cut of meat. How Long Do You Need to Marinate a Tri-Tip Roast? Mix up your favorite marinade, place the beef in a zip-closable plastic bag and give that beef a good two or three-hour soak in the marinade. Be sure to turn the meat over at least once so the marinade can penetrate into the beef well. We mixed up an easy marinade of balsamic vinegar, garlic, soy sauce and spices that is one of our favorite beef marinades. You can also rub a smoke-house beef rub over the entire beef and let it rest in the fridge for a couple hours. 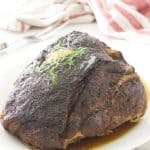 Tri-tip roasts are only a couple inches thick and a high-temperature oven is best for this roast. This gives the meat a rich crust while the center is moist and juicy. 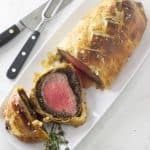 Place the marinated/seasoned roast on a wire rack set over a baking sheet, insert a meat thermometer in the center and slide the pan into the preheated 425°F oven. 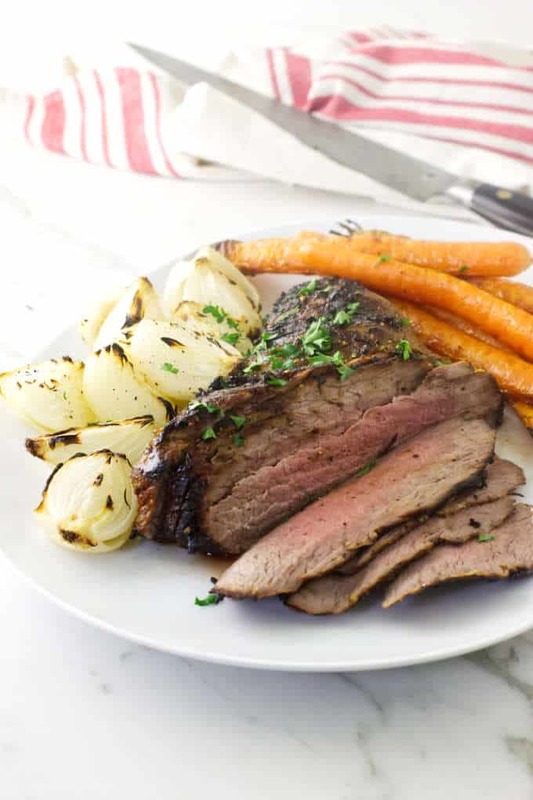 How Long Do You Cook a Tri-Tip Roast in the Oven? Roast for 30 to 35 minutes (at 425°F) or until the thermometer reaches your preferred doneness. For a medium-rare roast, remove it when the temperature reaches 135°F. For medium, roast about ten-minutes longer, until the temp reaches 145°F. Remove the roast from the oven, cover with aluminum foil and allow to rest for 15-minutes. Transfer the roast to a cutting board and slice across the grain into thin slices. We like to serve big fat baked potatoes, topped with a dollop of sour cream with our roast. Scrub up some baking potatoes, prick them with a fork in several places and toss them into the oven at the same time the roast is put in the oven. They will be ready to serve by the time the roast has rested and sliced. Wash and trim a few carrots, cut onions in half, drizzle with oil and place them on another baking sheet. Pop them in to roast as soon as you remove the roast from the oven. Calculate twenty-minutes for the carrots and onion and they will be ready to serve after the roast has rested for 15-minutes and sliced for serving. Make a crisp salad in advance and refrigerated it until serving time. Or, if you are into multi-tasking, put it together while the roast and vegetables are cooking/resting. Vanilla ice cream with a hot, Rich Chocolate Sauce is a quick two-ingredient, five minute fix that is a perfect dessert anytime. Our Coconut Cake Roll is an easy ‘make in advance’ delicate and delicious treat you will love. Try this fun, make-ahead Mocha-Chocolate Icebox Cake. This no-bake dessert is surprisingly easy to make using store-bought chocolate cookies or your own homemade favorite cookie. There! We just put together a complete menu for you! 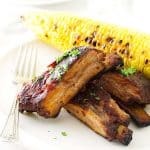 This is a meal for family week nights or a special dinner with friends. This budget-friendly cut of beef has very little fat. A two or three hour marinade increases flavor and tenderness of this flavorful cut of beef. Oven-roasted at a high-temperature gives this tri-tip beef a rich crust and a moist and juicy center. Place the tri-tip roast into a closable plastic bag and set aside. Whisk the marinade ingredients together in a small dish and pour into the bag with the roast. Press the excess air out of the bag, zip it closed. Massage the meat well, turning within the bag to coat completely with the marinade. Place in the refrigerator for 2 to 3 hours. Preheat the oven to 425°F, set a wire rack over a baking sheet. Remove the marinating roast from the plastic bag, letting excess marinade drip off. Place the roast on the wire rack and insert an oven thermometer into the center of the meat. Grind black pepper over the top. Transfer the baking sheet to the oven and roast for 30 to 35 minutes or until desired doneness. For medium-rare 135°F, for medium 145°F. Remove from the oven, cover with aluminum foil and rest for 15 minutes. Transfer to a cutting board and slice across the grain in thin slice. Place on a platter and serve. This cut of meat is also called a triangular sirloin roast, culotte roast or a California Cut. Use your favorite beef marinade or smoky rub to enhance the flavor. A spicy chipotle or an Asian marinade is delicious. Resting the roast for 15-minutes will increase the internal temperature by approximately 10-degrees. Gorgeous! I will definitely have to try this!